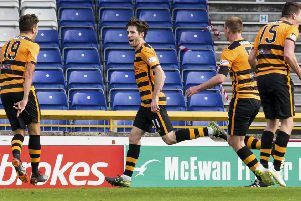 Iain Flannigan’s late equaliser bagged Alloa’s second point of the campaign as United missed the chance to go joint top. 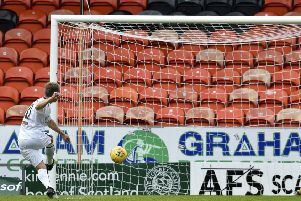 The part-timers made a bright start, Dario Zanatta forcing an early save from Matej Rakovan before Scott Taggart sent a 20-yard effort narrowly wide. United responded with their first serious attempt in 25 minutes but Frederic Frans saw his right-footed shot drift just off target. United went close again on the restart when Frans headed narrowly wide but Alloa showed no signs of inferiority and continued to create chances. Zanatta looked Alloa’s most likely source of a breakthrough and he went close with a 24-yard shot that was inches wide of the target. United’s Paul Watson struck on 71 minutes, producing a glancing header into the bottom corner from Fraser Aird’s corner. Yannick Loemba had an effort ruled out for offside before the Wasps hit back through Flannigan’s superb 25-yard free-kick which soared high into the net.